This iExpression is applied to the orientation of a 3D layer. It orients the layer such that it always "looks" towards the given point. The orientation can still be adjusted using keyframes as usual. is the point at which the layer should "look". flips the orientation such that the layer does not look at the point but looks away from it (i.e. turns its back on it). if you choose 'other point' here, the layer looks not from its own position but as if it was located at some other position. If you want, for example, that the layers looks in exactly the same direction as another layer which uses this iExpression, then you can simply link this other layer's position to 'other point'. 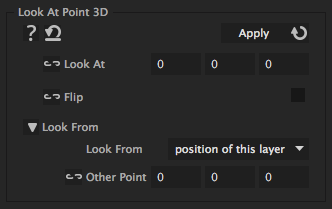 is the point at which the layer should "look" when the option 'other point' has been choosen for 'Look From'.